"I'll Keep Walkin', Thank You!" 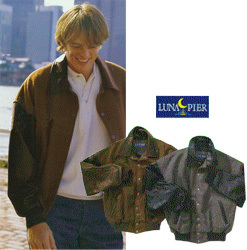 From Luna Pier: 100% polyester, unstructured, 5 paneled, low profile cap with Clip Snap closure. You can sport an optimum cold weather baseball cap and tell those pesky winter winds that "Oh!, I'll keep walking, thank yoooou! Club 440 logo embroidered on front center of cap. From Timberline Colorado. Got a $40 hair do from Martha's Curl Up and Dye Hair Salon that you don't want to turn into a hair don't? 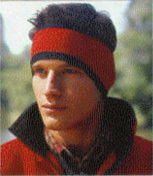 Keep your ears warm and show off that coif on the slopes with this 100% polyester no—pill fleece headband. The embroidered Club 440 logo makes this item a great and inexpensive stocking stuffer! "Only Wanna Do What's Right"
From BAC Premier! Whether you are walkin' down a wintry beach (along the sands of time), or making snow angels, or on your way to an outdoor winter sports event, you really want to do what's right to stay warm, comfortable and look great. So do it right with this heavy duty 80% cotton/20% polyester flannel—lined hooded pullover sweatshirt with quarter—zip closure. Brushed plaid—lined hood, placket, and pockets. Body colored draw cord at hood and waistband. Underarm gusset with grommets. Ultra—suede tabs with brass buttons and grommets. Two front welt pockets. The Club 440 logo is embroidered on the left breast. A great quality hooded sweatshirt!! "Take Another Look At Me"
by Luna Pier. Folks, when you put this sweatshirt on you are going to get double takes galore from all your brethren at the next church social. This is an awesome dress casual utility sweatshirt that will look great with jeans or khakis, and don't forget some penny loafers with no socks to complete the look! 55% cotton/45% polyester sweatshirt with locker patch, taped twill neck backing, and fully cover stitched. Club 440 logo embroidered on the left breast. When you put these 100% polyester fleece items on you are going to shout the praises of our great and awesome God for blessing you with funds to purchase it for yourself or someone you love. 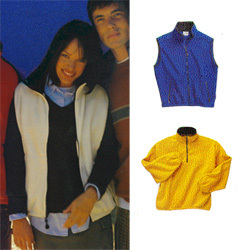 Both the vest and pullover have side pockets, two piece collar with inside black contrast, Supplex Nylon Trim, elastic waistband and Lycra cuffs. A great, light, final layer to your layered winter ensemble. Club 440 logo is embroidered on the left breast. by Lee Jeans. Want that rustic, broken in look? 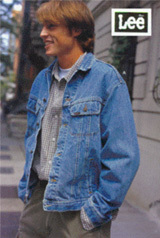 Then this heavyweight 100% cotton denim jacket with two front flap pockets, two side welt pockets, brass buttons with Lee Logo, and two button adjustable waistband. Stonewash Finish. Club 440 logo on left flap pocket with www.bryand.com logo sitting just above. A classic American fashion. by Luna Pier Urban Legends. You can almost see Bryan wearing this Nifty Jacket of 100% Premium Melton Wool body with leather sleeves and leather laydown collar. Step by step you and this Jacket will look smart on your way to Church on cold days. Antique Metal Snaps and Slash pockets. Ribbed trim cuffs and waistband. Quilted lining with inside pocket. Club 440 logo on left breast. www.bryand.com logo on right breast. This is the best deal of the whole Niftygear catalog. You won't be Whistlin' in the Dark with these heavy duty 9 oz. 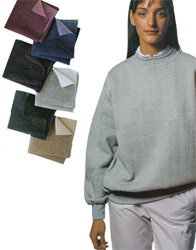 cotton sweatshirts with ribbed spandex collar, cuffs, and waistband. Fully cover seamed. Club 440 logo on left breast. by Luna Pier—This 65%/35% cotton peached chintz jacket with nylon lining will be a hit with the gang on old folks row for its classic look. Classics never go out of style and this one has all the new bells and whistles like a water resistant shell, full front raglan sleeves, 2" stand—up collar, ribbed cuffs and waistband. Side slash pockets with antique brass snaps. Club 440 logo embroidered on left breast. by Luna Pier—Wind in your hair, with your eyes closed, mist on your toes, look where we are! 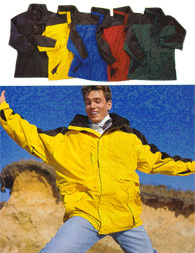 You are strollin on the water wearing the appropriately name Compass Jacket. 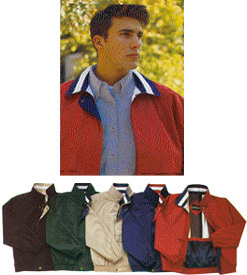 This 65%/35% cotton raglan sleeve jacket with 100% nylon sleeve lining will put you high over every care. It has a weather resistant acrylic coated shell, striped body lining, elastic cuffs, and waistband. Full front zip with two antique brass snap closures and slash pockets with flap closures. Club 440 logo embroidered on left breast. by Luna Pier—You will find a safe harbor in this Heavy Duty 100% waterproof and windproof nylon jacket. 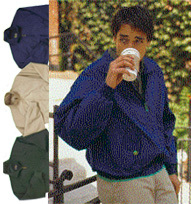 It has a mesh lining, storm placket, and snap closure. 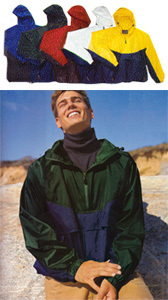 Zippered front lower and right chest pockets. Left chest flap. Drawcord waist, elasticized cuffs with adjustable velcro tabs, Tech roll up hood with velcro tabs at back and front of neck. Zippered underarm vents and velcro vented back. Club 440 logo embroidered on left chest flap. Be ready for anything—even in the dark with this versatile 100% rip—stop nylon waterproof and wind resistant pouch jacket with two tone yoke front. Drawcord hood and bottom. Dyed to match zippers, raglan sleeves and zip pockets. Back zipper pocket with belt loops for fold away pouch. Club 440 logo embroidered on left breast.